I have the Italian Marble lipstick in Berry Banana (the first one shown in the lineup)- and I love it! Very soft and moisturizing (truly feels like a lip balm), and the color is gorgeous. I'm thinking about getting this set because the other two shades look really nice also. 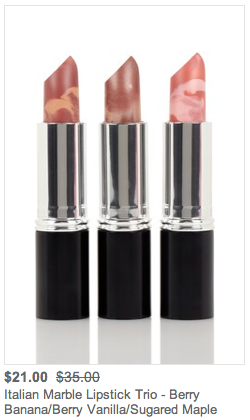 Since these are marbled, no two are exactly alike... so you may get a lighter or deeper lipstick depending on how the shades were mixed, and it may change as you keep using it. I actually think that's pretty cool! 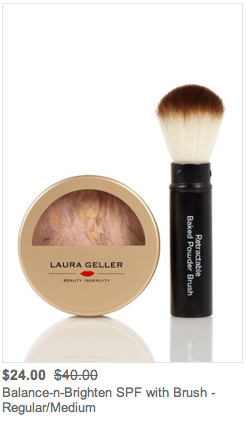 This is a classic Laura Geller must have product. Balance & Brighten is fantastic as a powder foundation- or you can use it over a liquid foundation to boost the coverage. It does a fantastic job of evening out the skintone, and contains swirls of various colors, including yellow- which is very corrective. I love this product (I wear Regular), and my mom loves it too! I can't vouch for the brush (I don't have it), but this price for the powder alone is awesome. A few more notes... 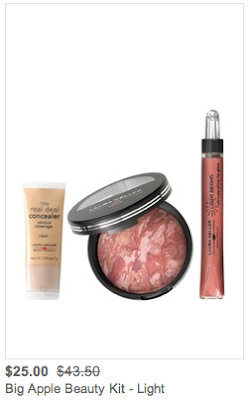 I do like LG's baked eyeshadows, but don't own any of the ones offered in this sale. They can be worn wet or dry, and unless they say "sugar free"- you can assume they have a healthy amount of shimmer. I think the Eye Rimz gift set looks like an especially good deal- those shades would make great liners or smokey shadows. I noticed the After Hours Eye Set contains At Long Lash Mascara... that is one of my LEAST favorite mascaras of all time. Goopy, thick, wet, and way too much formula comes out on the brush. Hard to use. The Spackle primer is good, but I didn't have incredible results in terms of the impact on my foundation's staying power. A few of the Air-Whipped Blush & Bronzers are for sale either alone or in kits- I have a full blog review of that product here, but in a nutshell, I'm not a big fan. It continues to have kind of a moist feel even after it's applied. Just shot a couple of videos. Productive day so far! Watched a LOT of basketball yesterday. I don't really get into it unless it's March Madness time. I'm am wearing the ultimate in springy tops right now- you'll see it in an upcoming video. Meanwhile- we have several inches of snow on the ground! Frankly, I don't really mind, but I know Tyler would like to be able to get out and golf at some point! For anyone who likes the spackle primers, you can get a jumbo size Champagne one for half price at ULTA on Tuesday 3/26 as part of their 21 Days of Beauty steals! I am so excited that you did this post! I was just browsing Hautelook but I don't have any Laura Geller products so I wasn't sure what to focus on. Can you do another Heads Up post for the next time The Balm is on Hautelook? Thanks Emily! But just wanted to mention that I did some comparison shopping. I put the balance and brighten in my cart and was about to buy it. With shipping it comes to $31. But at Macy's you can buy the same (minus the brush) for $33. So with Hautelook, you do get the brush and save a few dollars. But for me, I decided I'd rather just go to Macy's and see it in person. 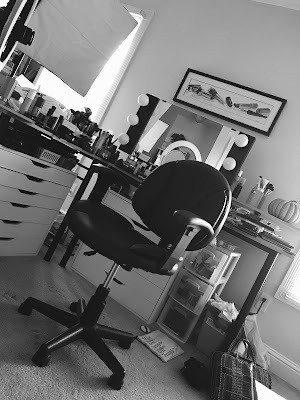 I got The big apple kit last time it was on Hautelook, it's great. That concealer is insane, you need the TINIEST amount of it. This time I got the balance-and-brighten (it sold out last time) for me and my mom and I got the Beauty a La Mode Set. So excited! I absolutely LOVE when you do these posts! I purchased a few of these products in the past just because they were recommended by you! Thank you for opening me up to this brand and letting us know they are on sale! Emily, thanks for the update! I was able to pick up some B&B in fair, some lipsticks and a highlighter set. Your product reveiws are "simply the BEST EVER". Making sure to mention if a product has shimmer, or metallic finishes is so very important and I figure you alone SAVE ME mass amount of dollars by reading your reviews. Thank you so much for your honest opinions!!!! Finally got all the products in the mail today. Sadly the Balance & Brighten is broken. The pencil eyeliner was broken too. When I tried to twist the pencil up, a big chunk just fell off. Bu I swatches the products, they are good stuff. Have you used the air whipped lip wear before? The texture is very different which I think is interesting. It's almost powdery. 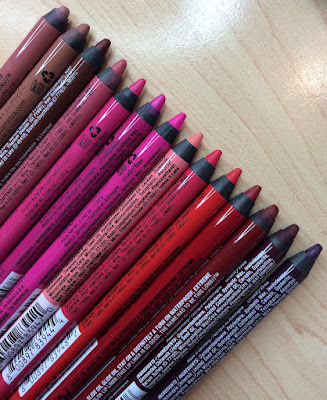 Emily, I just received my lipsticks (I got the regular creme couture ones) that I ordered fro. Hautelook!